Oh, Facebook. Always with the weird, unwanted, hard-to-undo changes. Like a couple weeks ago, I noticed that all of a sudden, every status update I posted included my location! I’m quite sure I didn’t request or enable that feature. Previously, each update would note the time it was posted: “8 minutes ago,” “2 hours ago,” “yesterday,” and so on. 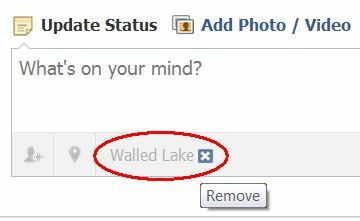 Now, Facebook tacks on information about where I was when I posted: “near Wolverine Lake,” for example. If you’ve noticed this as well, you’ve probably pored through Facebook’s settings in search of a way to turn it off. Amazingly, there is no such setting—not that I could find, anyway. But there is a way to disable this unwanted location awareness, and it’s hiding in plain sight. When you click in the Update Status box, you’ll see your closest city listed in the gray bar along the bottom. I probably looked at this a hundred times without actually realizing what it was or why it was there—it just kind of snuck under the radar. Mouse over that city and click the little ‘x’ to the right of it. Presto! No more location information tacked onto your status updates. If you want to restore it, just mouse over the now-blank area where the city used to appear, then click Add current city. I’m glad this is such an easy change to undo, but annoyed that Facebook keeps slipping in stuff like this without notifying users or providing a straightforward opt-out option. Windows' standard screensaver window should appear, with Google Photos Screensaver already selected. Click Settings. Now it's time to choose one or more sources for your screensaver: Picasa, your Picasa Web Albums, one or more folders on your PC (which, admittedly, are probably already represented within Picasa, so this may not be necessary), and/or public sites. This last can be any RSS photo feed, like from Flickr and other sites. Just enable the sources that you want, then click Configure if you want to fine-tune the settings (which you'll need to do for PC folders and public sites). Next, choose a visual effect from the pull-down menu. You can also use the slider to adjust the time between photos. When you're done, click OK.
Back at the main Screen Saver Settings menu, click Preview if you want to see the setup in action. You may also want to adjust the time before the screensaver kicks in. (10 minutes is the default, but I prefer something a little longer.) Click OK when you're done. I think you'll love the Picasa screensaver, which effectively turns your PC into a killer photo frame (when it's idle, of course). And here's a bonus: If you have multiple monitors connected to your PC, the screensaver will take full advantage of them, showing a different photo on each one. Sweet!